Founded over the final resting place of St Cuthbert, its Norman cathedral became a centre of pilgrimage in medieval England. The cathedral and adjacent 11th-century castle were designated a World Heritage Site by UNESCO in 1986. 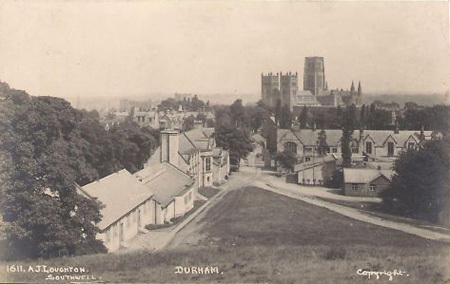 A view of Durham Cathedral. This photograph is numbered 1611, the photograph of The East window, St. Mary's Abbey, Melrose is numbered 1514, maybe Alfred stopped in Durham on his way back from Melrose?